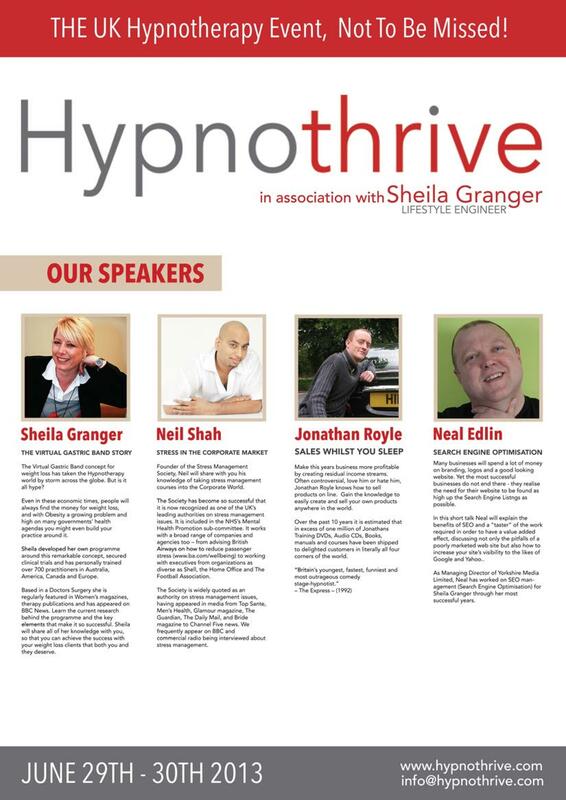 BOTTOM LINE – Marketing, Advertising, Publicity & Promotion are the Keys to making money in ANY area of Hypnosis. There are FAR CHEAPER and easier ways to learn Tried, Tested and Proven To Work Marketing that will get you more shows for bigger fees and more therapy clients for bigger profits and also enable you to make massive $$$ whilst you sleep selling Hypnosis Products than joining schemes like “The Empower Network”. OR PERHAPS YOU WANT TO KNOW EVERYTHING???? Incidentally “Hypnosis Passive Profits” is the exact System that me and Robert Temple have used on a few projects in the past few years to pull in over $1.2 Million US Dollars and we show you EXACTLY how to do this in easy to understand step by step video trainings and supply all the web templates and other stuff you’ll need including tons of products with “Legal Resale Rights” and all the knowledge you’ll ever need to profit from selling them! Incidentally for those who may not be aware Robert Temple is fast becoming a top name in the Internet Marketing World in his pen name of “Marc Milburn” and literally in the past few days has been in Florida teaching Hypnotic Internet Marketing Sills at a Conference in Florida where he has been sharing the stage with such key players in IM as Mike Filsaime, Tom Beal, Omar Martin and an incredible group of other seven and eight figure marketers. IN OTHER WORDS: The Stuff we Teach in “Hypnosis Passive Profits” is the stuff that REALLY WORKS. And as both me and Robert Temple are successful Hypnotists, we teach it in a manner where it is 100% Lazer Targeted at your “Niche” of HYPNOSIS. 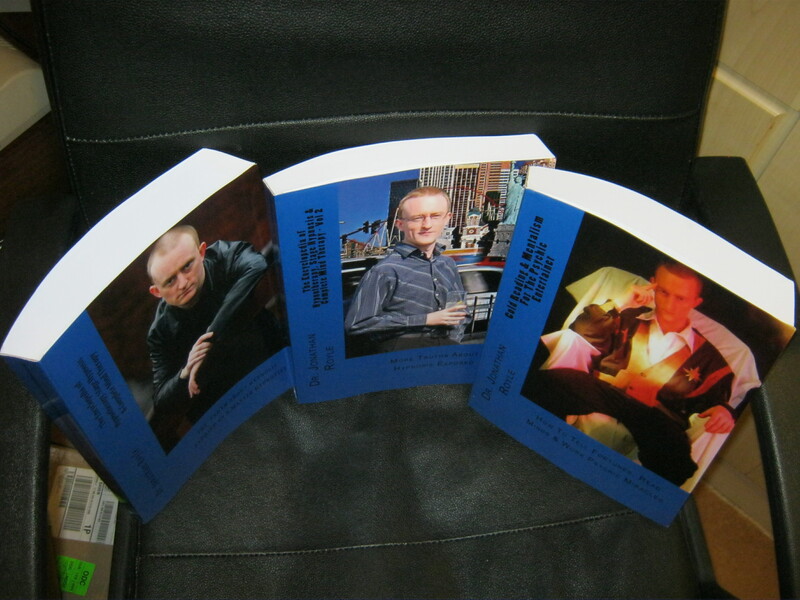 From his stage debut aged 3 and a bit as Flap The Clown, his time working as a Magician, the years as a Fraudulent Clairvoyant and Fortune Teller, all the way to how he became probably the youngest ever working Professional Hypnotherapist and Stage Hypnotist in the world, its all within the pages of this Shockingly honest autobiography. The insights into how he has Controlled and Manipulated The Media (TV, Radio, Newspapers and Magazines) around the world and been linked to A-List Celebrities with his “Mind Skills” are invaluable for anyone working as a Hypnotist (Stage or therapy) or indeed in any field of the entertainment industry and could easily help you make more money and achieve more success in your work, when the insights you will learn are put into action yourself. Indeed you’ll also discover how he succeeded in exposing many of the often ILLEGAL techniques used by the now defunct “News of The World” and also Exposed the dodgy and unethical antics and fabricated stories of certain other journalists. 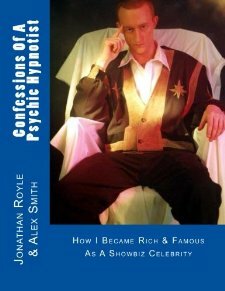 As you read this book which is often Shocking, Controversial and extremely eye opening (not for the easily offended) You’ll be taken on a roller coaster ride of emotions and discover exactly what truly goes on behind the scenes and what it truly takes to become a success in the world of Showbiz and also Hypnosis. From having his ear ripped off by a Puma (Wild Cat) on the Circus, being hit around the head everyday by Chimpanzees, very nearly disfiguring himself for life whilst Fire Eating, attempting Suicide during childhood due to being the victim of constant bullying, overcoming serious Alcohol and Drug issues, right through to almost getting killed whilst trying to set a World Record for Under Water Escapology, this is perhaps the most bizarre life story you will ever have the pleasure of reading. WARNING = On A side note, although the contents of this book will prove both Entertaining & Educational to anybody connected to the worlds of Hypnosis, Magic, Mentalism and Related fields, I would strongly advise anyone and everyone to read this book BEFORE they ever Spend a Single Penny on any form of Live Hypnosis Course, Seminar and/or event and also BEFORE they spend a single dime on purchasing any form of Hypnosis, NLP or related training DVD’s, Books or other home study materials. 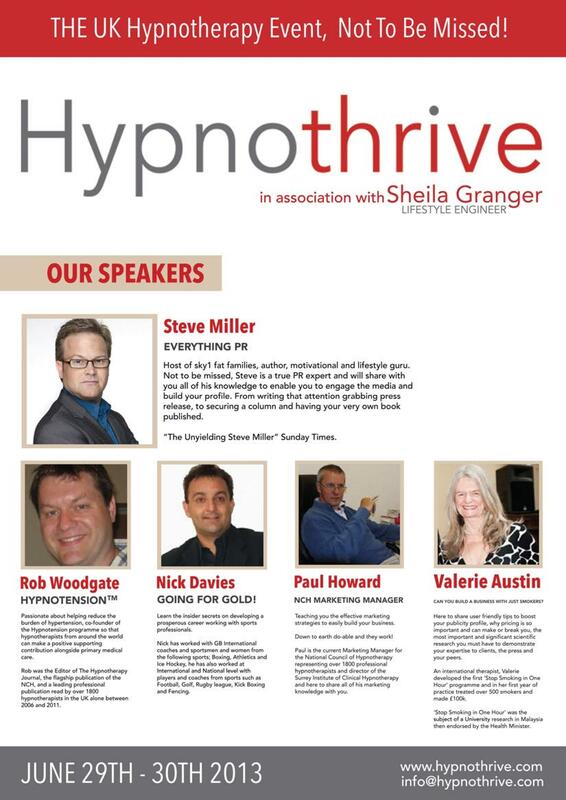 As within its pages you’ll discover what Medical GP’s, Plastic Surgeons, Nurses, Dentists and other Medical Professionals, along with many of the biggest names in the fields of Hypnosis and NLP truly think about Royles Unique Hypnosis Training. Yes indeed this book finally reveals the REAL TRUTH behind all of the rumors, lies and vindictive BS that many of Royles so called competitors often spread about him on the internet and elsewhere. BEWARE = When you read this book, your in for some serious surprises and quite possibly the odd tear or two will run down your face along the way, whilst at other times you’ll run the danger of wetting your pants with laughter. 01) Cold Reading & Mentalism For The Psychic Entertainer – 478 Pages. £30 or $47 Post Free. 02) The Encyclopedia of Hypnotherapy, Stage Hypnosis and Complete Mind Therapy – Vol One. 514 Pages. £18.59p or $30. 03) The Encyclopedia of Hypnotherapy, Stage Hypnosis & Complete Mind Therapy Volume Two. 362 Pages. £30 or $47 again Post Free. If you have previously studied any of my Hypnosis and/or Mentalism Materials then PLEASE Leave A review of the books on Amazon and also click “Like” on each of the Amazon Product Pages. If you could do that it would help the rankings greatly and be hugely appreciated as its my aim by Xmas to make these the Worlds Best Selling Books in their Subject Areas. I Can GUARANTEE you they are the most informative books ever written on the subjects and contain everything you’ll ever need for succcess! 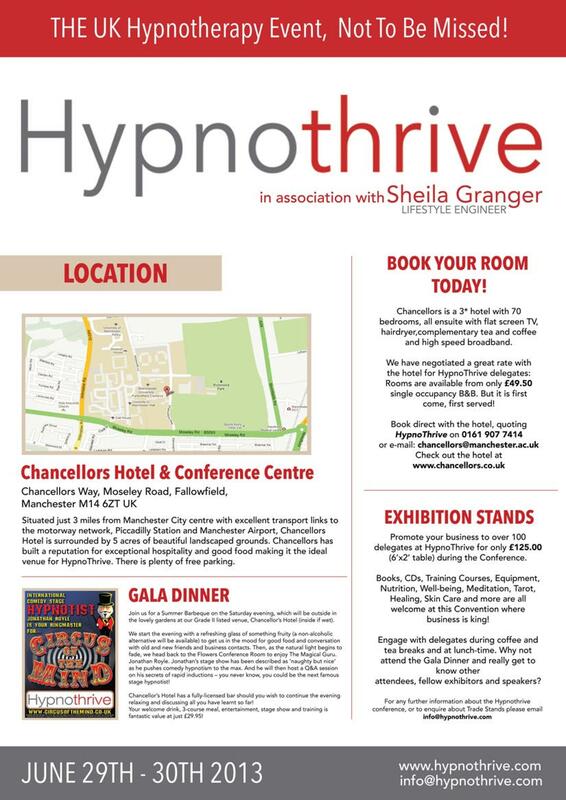 HYPNOTHRIVE – How To Make Way More $$$/£££ From Your Hypnosis..
And yes I am doing a Comedy Stage Hypnosis Show on The Saturday night and also a Rapid & Instant Inductions Workshop, as well as revealing some of my marketing secrets with other Successful Hypnotists.